I love trying new beauty products, but once I find something I swear by, good luck getting me to stray! 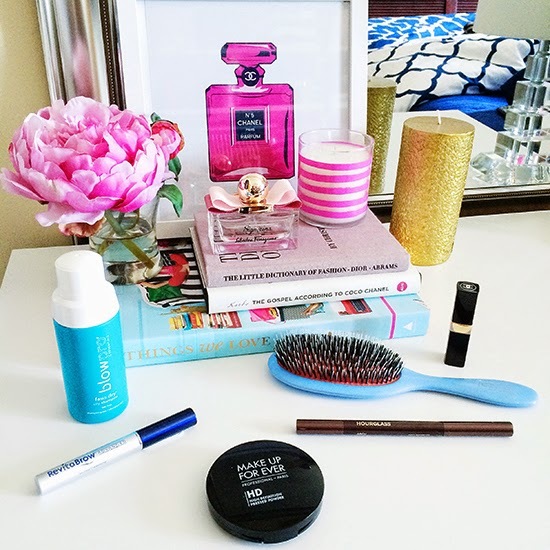 Today I am sharing my all-time, absolute favorite products that I swear by. And I invite you all to share the products you swear by, since that is the best way to find great products. Let’s start with the beauty product that changed my life – Hourglass’s Arch Brow Sculpting Pencil. Seriously, it’s a game changer. Unfortunately, I made the mistake most young women make and over-plucked my brows well into my twenties. I have spent the last three years trying to get fuller and more shapely brows. I love my Anastasia eyebrow lady who waxes my brows and constantly lectures me on their inadequacies, but their system, which includes penciling, stenciling with powder, and setting with gel, was a lot of work. Then this summer Kirsten introduced me to an eyebrow pencil that is powder, pencil, and wax in one easy step! I am so obsessed with this pencil and how full and perfect it makes my brows look, that I won’t leave the house without using it – even if I am not wearing any other makeup that day! If it seems that I have a slight eyebrow obsession, that’s because I do! I would give my left arm for Lilly Collin’s brows. This brings me to the second beauty product I swear by – RevitaBrow. This witchcraft actually helps you regrow your brows. In fact it is so powerful, you have to be careful. When I first started using it, I would apply my eye cream before I let it dry. Applying the cream accidentally spread the RevitaBrow around my eye and upper cheek bones, and before I knew it, I was sprouting hair under my eyes and across my cheeks! Thank god it went away when I waxed it off and applied my RevitaBrow more carefully. Side note – I have also tried RevitaLash and while it worked, I had better results with Latisse. Moving on from my brows, I also swear by my Mason Pearson Bristle and Nylon brush. Now before you scoff and say you would never spend that much on a hair brush, hear me out. These brushes last forever, and the combination of natural boar hair and nylon distributes your hair’s natural oils and gives you soft, fuller, and healthier hair. Seriously! I only wash my hair twice a week now. After years of thinking my hair dresser was crazy, I have finally conceded she was right and that washing my hair as little as possible has transformed it. I have really oily hair so getting to two washes a week was a long time coming. My only saving grace was finally discovering the perfect dry shampoo – Blowpro’s Faux Dry Shampoo. What I love about this dry shampoo is that it isn’t an aerosol, so it doesnt apply too much product and give you white roots. I have the best results when I apply it before bed. When I do actually wash my hair, I love Lush’s Big shampoo. It is an all-natural concoction of sea salt, seaweed, coconut oil, avocado, and citrus. The sea salt absorbs oil, exfoliates your scalp, and gives you hair massive volume. The seaweed, coconut oil, and avocado rehydrate and the citrus gives your hair a great shine. Nothing else makes my hair look or feel as good as this shampoo. There is only one downside. The sea salt can dull colored hair (which of course I have), but it isn’t too much of a problem so long as I only wash twice a week. I would be cautious if you color your hair and wash it more than three times a week. Although this shampoo might be worth a few extra trips to the hair colorist, just saying. Another miracle worker? My Make Up Forever HD Pressed Powered. This stuff is magic. It sets your make up, gives your skin a flawless, almost silky finish, and can be reapplied throughout the day to absorb oil. And it never looks cakey! Finally, I have found the perfect everyday lipstick – Chanel’s Rouge Coco Shine in Confident (94). What I love about this lipstick is that it gives just the right amount of color, shine, and hydration for everyday wear. It isn’t heavy, but the subtle sheen and color livens up your face. It looks great with no makeup but looks just as good with a full-face of makeup. It’s a win win! Ok, now it is your turn to share! Comment with one (or some) of the products you swear by!